Each week, 52 million kids take to America’s gymnasiums, playing fields, and race tracks. Many of them dream of becoming the next sports superstar. While they train for countless hours to get to the top, sacrifice and dedication are often not enough. Young athletes have no idea that a different field of competition awaits them down the road: the game of professional sports business. Without adequate preparation for this winner-takes-all industry, athletes risk derailing an otherwise promising career with a single business misstep. 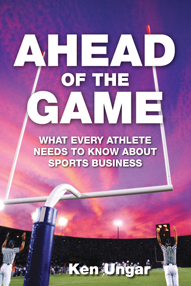 Combining his experience with the insights of other industry insiders, sports business consultant Ken Ungar created Ahead of the Game: What Every Athlete Needs to Know About Sports Business, a complete primer for young athletes and their families on the challenges they will face off the playing field. This practical “how to” book walks the reader through complex sports business topics, like marketing, law, insurance, finance, and career planning, in easy-to-understand terms. For the athlete first dreaming of a career in pro sports, this book provides a better sense of the challenges that lie ahead. For the more advanced athlete, Ahead of the Game serves as a valuable checklist of issues to address now. Every athlete wanting to make the most of a career in professional sports needs this book to stay Ahead of the Game.